Let’s explore these six qualities in detail. Ability to put winning strategies to use. 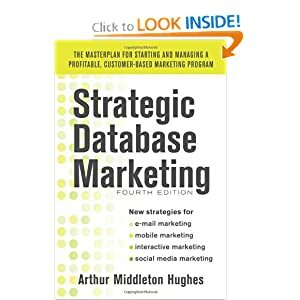 In database marketing, strategy is everything. Most people don’t realize this. They think that database marketing is about databases and computers. It isn’t. It is about marketing, and specifically, how to apply profitable strategies to a marketing situation. Ability to see things from the customer’s point of view. Why is this important? Because it is the one quality that is most overlooked. What we are trying to accomplish with database marketing is to build lasting relationships with customers that will promote loyalty, retention, referrals and increased sales. There is only one way to do that: offer programs, products and services to the customers that they want, need, like, appreciate, value, and wish to have more of. So many database marketing programs fail. The key reason for the failure in most cases is that the customers didn’t want what they were being offered. Too many marketers see customers as targets, not as friends. They adopt the language of warfare, and act like generals in the strategic bombing command. They conduct database marketing as if it were synonymous with modeling: use the correct demographic overlays, sufficient multiple regressions or CHIAD analyses, and the database will generate profits. Now, of course it is true that modeling can improve profits in acquisition marketing – and in the short run can even help with customer profiling and segmentation. But if you cannot come up with programs that customers see as in their long run best interest, you will ultimately fail. Airline miles work. Why? Because people like what they get with them. People like to be recognized. People like it when you use their name. You don’t learn these things by studying a model. You learn them by thinking like a customer. Put yourself in your customer’s shoes, and say, “Why would I want to be on this database? What’s in it for me?” The answer to this question tells you what your database marketing program should look like. Leadership Ability. Successful database marketing involves many different parts of a company. It can seldom be carried out by the marketing department alone. Consider the Hertz Number One Gold Club. When you rent a car from this club, they get your car ready before your plane lands. They put your name up in lights with an arrow pointing to your car. The trunk is open. The motor is running and the heater (air conditioning) is on. All of this takes a lot of coordination in the company. It is not just a marketing gimmick. It was dreamed up by the company’s marketing staff. But to work, top management and thousands of employees throughout the Hertz system had to be trained and clued in on the program. Successful database marketing is like that. The successful database marketer provides leadership to the customer service staff. If they don’t report to her, at least she helps set their guidelines and get their budget approved. She is very concerned with what they say to the customers. She takes the leadership to set up a customer communications committee within the company that coordinates customer contacts not only by mail and by phone, but also in personal contacts at the store, branch or dealer level. She forms a working team including MIS, customer service, sales, market research, accounts receivable, her service bureau, her direct agency, the operations personnel in her company. A successful database marketing executive has to have to have a vision of what customers should see in your company. She has to have the leadership ability to get others to see this vision, and take the necessary actions to make the vision a reality. Willingness to get your hands dirty with follow through. As Robert Burns said, “The best- laid schemes o’ mice an’ men gang aft agley”. Murphy’s law is alive and well in the database marketing field. Every great plan can be ruined by poor execution. How do you avoid this? By constant monitoring of output. By now twenty thousand people have heard about my Mary letters. In the invitations to the two day seminars on database marketing that Paul Wang and I give in Washington and San Francisco, we always send personal letters, many of which have first name references in the body of the text. Last spring, the programmer who translated our April letter into reality forgot to write the code to convert the first names in the letters. Twenty thousand people, no matter what their first name, were addressed as “Mary” in the letter. I should have checked the letters before they went out. I always do. But in this case, I had been out of town. I was tired. They told me that the letters had been checked and were OK. The result: a very expensive disaster both financially, and in reputation for me and for The Database Marketing Institute. I had to send out twenty thousand first class apologies (after taking out the 169 people whose name actually was Mary). During this fiasco, four hundred people wrote or faxed me their angry or humorous reactions. (“Our secret is out. How did you find out about me and Mary?” ) Many of them told me that they had made similar mistakes in the past. The lesson? You can’t do good database marketing unless you are constantly monitoring your delivery methods and your output. Your customers see your output. You can ruin your reputation with thousands– or millions– of customers overnight if you are not constantly vigilant. Let me provide another example. I had a home equity loan, a credit card and I owned some bonds of the Chevy Chase Bank. One evening, they called me at supper time. The caller said that since I was such a good customer, they were going to give me two months of free life insurance. Thereafter it would be only $14 per month. “How much life insurance?”, I asked. “Two thousand dollars”, was the answer. Now I had $300,000 worth of life insurance already. Why would I want $302,000? Furthermore, Chevy Chase knew that I had $300,000 worth of life insurance. How? Because I had to tell them on my home equity loan application. What the database marketer who directed this program failed to do, was to make sure that the program used the customer information already available to the bank. I ended up angry with a bank that I had previously admired. Attention to detail and follow through is important! Ability to do financial analysis. Database marketing is a very accountable science. Every activity can and must be measured. If you are putting out a customer newsletter, you must know whether the newsletter is doing any good. How can you know that? By anecdotes? By responses to offers? Of course, these things are good. But the real proof comes from having a control group—an across the board customer segment that never gets the newsletter. You compare the retention rate, referral rate, spending rate of the newsletter recipients and non-newsletter recipients. If the newsletter is a success, the recipients will have higher rates in some or all of these categories. In addition, the higher rates will generate enough additional profits to pay the cost of the newsletter—and return a dividend besides. Database marketers must know how to compute the lifetime value of their customer segments. They must know how to use this lifetime value to evaluate the strategies that they come up with. Successful database marketers conduct tests. They do the back end analysis to determine the ROI of each test, and the effect on long term lifetime value. They must be able to use lifetime value to sell their programs to top management and to get their budget approved. Great database marketers are at home with numbers. Ability to be a change agent within your company. Database marketing requires change in most organizations if it is to succeed. Most companies are organized on a product basis: Vice President for Home Mortgages, Vice President for Credit Card Services, Vice President for Retail Services. Does the VP for Home Mortgages get compensated in some way if his customers take out a checking account or a credit card? Not likely. But customers see the bank as one unit: either a friend, or an impersonal mean-spirited tightwad. The way the mortgage department treats customers will determine how the same customers react to an offer for a savings account, a money market fund, or an auto loan. For database marketing, companies have to be organized and compensation provided on a customer segment basis. The segments should really be set up by spending levels. Gold customers (the top quintile) should have their own manager. The manager of Silver customers (the second quintile) should be compensated not only for increases in the lifetime value of Silver customers, but on the numbers of them who graduate up to Gold status. Database marketers have to push for such organizational changes. They also have to push for operational changes, as well. I dealt with a well known bank that had been trying to do database marketing for several years. Their problem was lack of feedback. Whenever the marketing staff sent out a promotion (for a CD, a home equity loan, a key account program), they never knew whether it was a success. Why not? Because branch personnel – and the personnel in the specialist divisions (home equity loan processing, for example)–did not bother to ask customers “what caused you to come in today to apply for this program?” It was absolutely impossible to do back-end analysis. The marketing staff tried in every way to get the situation changed, without success. They needed a champion at the top who could force change. They lacked this champion. Unless you are a change agent, your database programs will probably fail. The ability to construct a database, clean it and update it. This ability is important, but you can hire service bureaus to do this. Don’t put a constructor in charge of strategy. The ability to build models and to do statistical analysis. Modeling is useful, but you can hire modelers. They are not database marketers. Don’t put your customer relationships into the hands of a modeler. The ability to do market research. Don’t confuse market research with database marketing. Market researchers are trying to get at truth. Database marketers are trying to generate profits. The two goals are often mutually exclusive. Ability to put winning strategies to use. Ability to see things from the customer’s point of view. Willingness to get your hands dirty with follow through. Ability to do financial analysis. Ability to be a change agent within your company. If you are hiring new staff for database marketing, a junior marketer must understand and appreciate these skills. A middle level marketer must have experience in most of them. A senior database marketer must be a master of them all. In listing these six qualities, I am sure that I have stirred up some people who don’t agree with me. Let’s hear from you – I may well have omitted something very important.